Kamal Haasan also said that his political strategies will be pretty different from those of his peers. Veteran actor-filmmaker Kamal Haasan has already confirmed that he will be entering the world of politics and adding a new dimension to his career. During a recent speech at Harvard, the ‘Ulaga Nayagan’ opened up about his political gameplan and said that his core objective is to bring change by challenging status quo. “My true purpose today is to challenge the status quo and mediocrity that has plagued Tamil Nadu. When average businessmen and politicians set mediocrity as a standard, then rubbish becomes acceptable,” he added. He also made it clear that, just like his films, his political strategies will be quite different from those of his peers. “My films were different from my peers and I want to be different in politics too,” added Haasan. 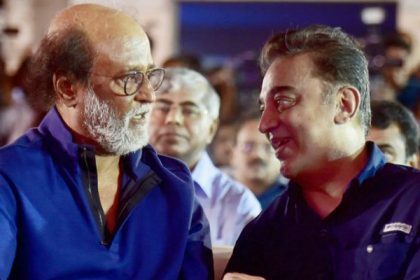 Interestingly, Haasan’s ‘arch rival’ Rajinikanth too has confirmed that he would be launching his political party and trying to surge the system, And, needless to say, fans have been keen to know whether the two stars will be joining hands in the near future. Addressing, Haasan said that the two will not be able to collaborate if Rajini’s colour is saffron. “I hope Rajinikanth’s colour is not saffron because if it is, an alliance is unlikely,” added Haasan. Well, this is a developing situation and it will be worth watching what happens next. On the work front, Haasan currently has Vishwaroopam 2 and Indian 2 in his kitty. Vishwaroopam 2 is a sequel to the 2013 release Vishwaroopam and also has Andrea in the lead. As far as Indian 2 is concerned, it is a sequel to Indian and is being directed by ace filmmaker S Shankar. On the other hand, Rajini currently has 2.0 and Kaala in his kitty. 2.0 is a sci-thriller and also has Amy Jackson in the lead. As far as Kaala is concerned, it is a crime-thriller and has been directed by Pa Ranjith.